Wheelers Transport are proudly ISO 14001 accredited - Wheeler & Son Ltd, A family run ISO 9001, ISO14001 and OHSAS 18001 accredited transport business based in Bridgwater, Somerset. The standard is generic and does not apply to any particular industry or business sector. It provides a strategic framework that can be used to meet internal and external objectives for Environmental Management. By achieving ISO14001 certification you will be able to clearly demonstrate your commitment to reducing waste and recycling materials where appropriate. The benefits to your organisation will not just be in cost savings, they may also prove beneficial when tendering for new business. Click here to read more about other benefits of achieving ISO 14001 accreditation. 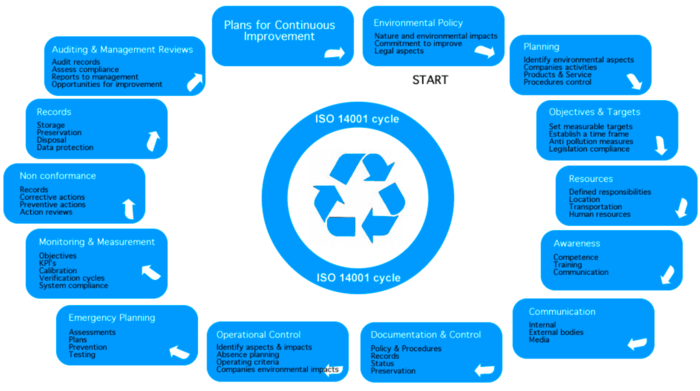 Because of its generic nature and universal acceptance, the ISO 14001 standard has the potential to affect the environmental management practices of virtually every manufacturing company in the world. It can also be used by charities, voluntary organisations and trade associations. Any organisation whose products, services or day-to-day activities have an impact on the environment needs to be aware of ISO 14001. Like ISO 900, ISO 14001 is a product of the International Organisation for Standardisation (ISO). ISO 14001 is the world’s first generic, internationally recognised standard for environmental management. Of the group of ISO 14000 standards, ISO 14001 is the actual standard to which companies get registered. Experts are predicting that the impacts of this dynamic standard will transcend the vast popularity of the world-renowned ISO 9001 quality standard. ISO 14001 measures the conformance of an organisation’s Energy Management System (EMS) to the specified requirements. Click here to read more about what to do next.